Last week I went to Michael’s to get more of that red glamour yarn for $0.99 a skein, and while I was there I also picked up 6 skeins of Michael’s Loops and Threads Willow yarn (also $0.99 each) in Strata (all that to say that it is a variegated purple nubby yarn) and I used 3 skeins to knit a very long infinity scarf. It’ll wrap three times around. The picture doesn’t do it justice, it is a very pretty combination of purple, lilac, light grey and charcoal grey with tufts everywhere. I might block it as it rolls and looks like a tube more than anything. I’ll see how I feel after I wear it tomorrow. 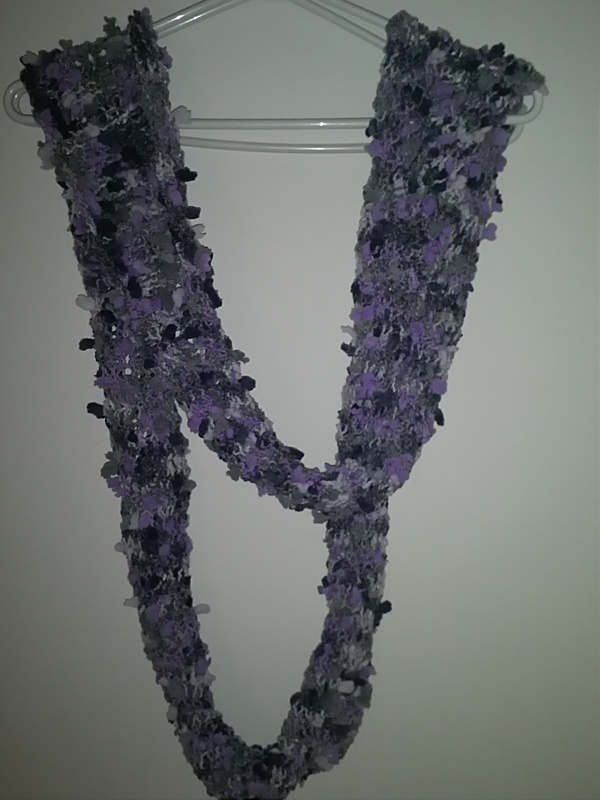 This entry was posted in Loom knitting, Martha Stewart Loom and tagged bulky yarn, infinity scarf, knit, loom knitting, Loops and threads, Michael's, scarf, yarn. Bookmark the permalink. Love it! Looks great, infinity scarves are so much fun. I love Michaels, especially when there are sales. Yes, sale yarn is quite addictive too!